Researchers want to identify key molecular events that turn healthy cells into cancerous ones, so as to develop better diagnostic tests and treatments. 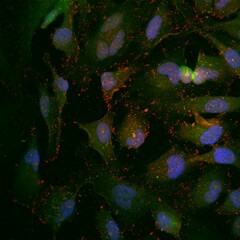 Here, cervical cancer cells from the HeLa cell line show the interactions of a kinase called LKB1 (in green), a cytoskeletal signaling protein called pFAK (red), and the cell nucleus (blue). These images are examining the influence of LKB1 in regulating FAK activity, which is frequently disrupted during cancer cell motility (movement) and invasion.